Documentation is food for the developer’s soul, and too many times we find it arduous to build out a documentation system for projects. 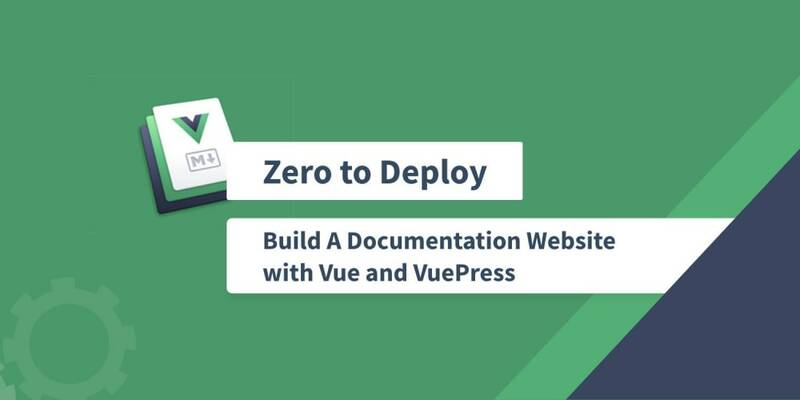 In this post, we shall be building out a static documentation website which is also a single page application using the Vue powered static site builder, VuePress. Static sites are basically websites which are served as stored. There is no direct client-server interaction except from embedded third party applications. Static site generators abound the internet and each differs from the other, while some favor speed and load times over flexibility, some others tout extended functionalities. Static sites are preferred because of its increased speed and the absence of a server mitigates the likelihood of security flaws. Recently released, VuePress features a static site generator as well as a default theme suited for building out documentation websites in no time. We shall be employing the default documentation theme to build out our system. I say, why not VuePress! By default, VuePress Parses markdown files as structured in folders into HTML files to be served. VuePress ships out of the box with Vue, Vue Router for creating individual routes and webpack for bundling assets. During build, each markdown file created is parsed as a Vue template while assets are bundled by webpack. Parsing the markdown files into Vue templates creates an avenue with which we can also pass in native Vue scripts in the form of single file components. VuePress is SEO friendly and by default provides a means to implement analytics tracking using google analytics on your pages. Also, VuePress ships with a minimal search system which indexes all headers on the website and displays them upon search. This displays the versions of node and npm installed respectively. If you don’t have it installed, you can download it from here. This quickly scaffolds a new project and creates a package.json file. Once we have VuePress installed on our project, we are ready to go as it ships with the default documentation theme which we require. However, we would like to customize the documentation to suit our requirement, let’s get to creating the folders and the files even though with dummy text. In the docs directory, we shall proceed to create the .vuepress folder and the documentation folders housing the files - counter and guide. Note, for each and any of these routes to work, we require a README.md file in each folder. This serves as a home route to that particular subsection. The counter folder contains markdown files to be parsed as well as default README.md files for the home page. The guide folder contains similar contents to the counter folder. The .vuepress folder houses the components directory, the dist folder which is created on build and the config.js file which is used to configure the overall system. This how simple building a counter gets. Currently, we have our Vue components, ready to be used. We proceed to create markdown files in counter and guide directories. See the markdown files for counter and guide. Frontmatter is used to dynamically set the title of the individual pages. The <counter/> component is also placed in the markdown file. details: A Vue counter developed using Vue is embedded in this doc, now that&apos;s the power of VuePress! We should be placing the my-header Vue component in the home route. Edit the README.md to include the component. So, far we have all the required Markdown files. Let’s proceed to configure the navigation and sidebar using .vuepress/config.js. The config.js file is used to customize the documentation system. In creating this custom system, we export an object containing required fields. First, we specify the title of the website and assign it a description which is great for SEO. This title and description input automatically provide an indexed search system on the website with a search bar. Next in the script is the themeConfig object which receives parameters required to implement certain functionalities on the theme. To create a nav bar, we create a nav array which contains objects specifying the display text and route of each nav element. You can see more on configuring the default theme here. We employed the use of grouped sidebars so we would be able to have a quick glance at the menu at any time in the documentation. The sidebar menu can be set to collapse by default using the collapsable property on the sidebar group. You can find more on the sidebar here. The local dev server is hosted on port 8080. Good thing to note is that VuePress ships with a hot reload feature which implements any change made to the application during development. Note that a restart of the development server is required if the Vue components are created while the local development server is live. Notice the header created with the Vue template? VuePress supports static files as well as webpack assets and care is taken to ensure that the URL assigned to an asset in markdown is correct before build. For our case, we just need to retouch the base color a little. We will proceed to override the default colors using stylus. Note that changes made to the stylus file reflects in the browser immediately. Step 1 Create an account on Github and Netlify. Push your code using Git to Github. Step 2 Log in your Netlify account and select the ‘New site from Git’ option. Choose Github as the continuous development provider and select the repository containing the documentation. Step 3 Specify the branch to deploy as master or choose whichever branch you would like to deploy. Set the build command to npm run docs:build and the publish directory to docs/.vuepress/dist. Click ‘Deploy Site’. Your website should be deployed in little time and a public URL is provided to access it. Here is the deployed version of this tutorial on Netlify. Static sites are considered for their speed, security, and maintainability. In this post we developed a static documentation website which is also a single paged app, using VuePress. VuePress offers the flexibility of writing Vue scripts inside Markdown files which introduces an amazing level of dynamism in static sites. Feel free to modify the documentation to include several folders and corresponding markdown files. Also check out the repository of this post and leave your comments and feedback. Happy coding!